Creating custom sculpted cakes are always much harder then they look. 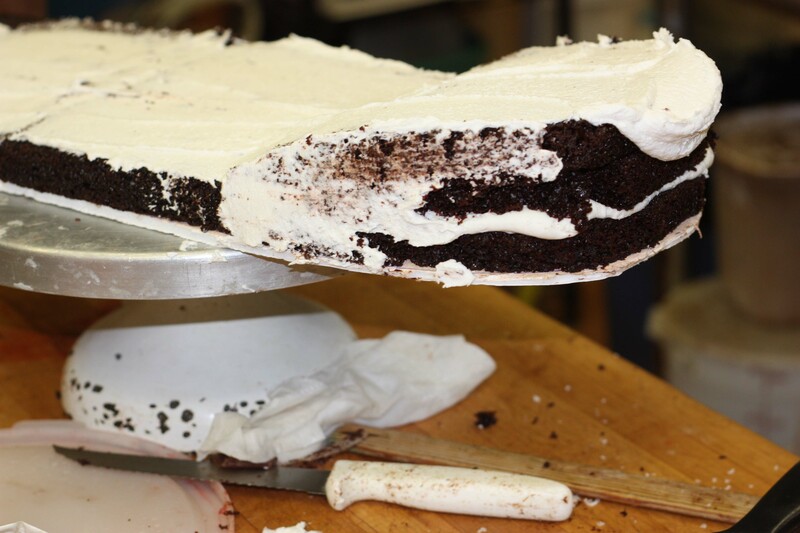 Especially when one is doing a sculpted cake truly all cake…..NO rice krispy or Styrofoam in the cake. Then sizing it up and down. An engineering task. Here at Sedona Sweet Arts we love the challenge of doing your cake, in actual cake! Seriously no rice krispy or Styrofoam something unique. 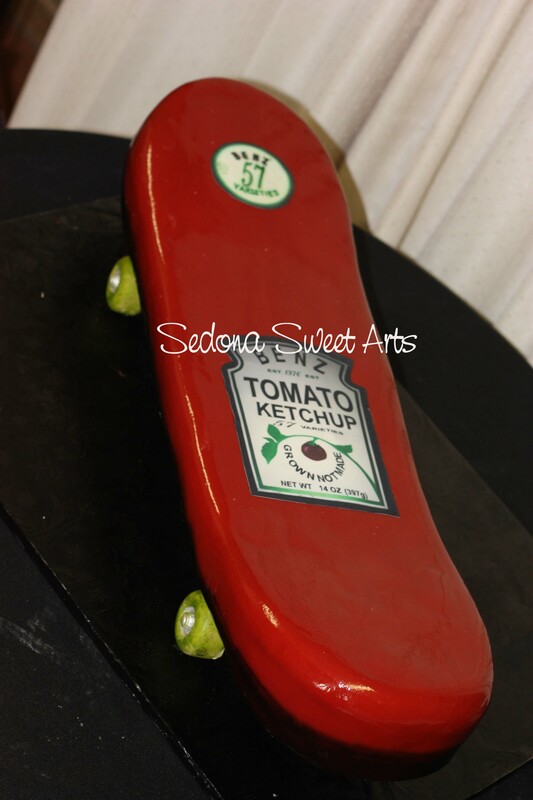 Job ~ Skateboard Cake ~ Surprise Grooms cake to be delivered with wedding cake ~ Flavor Black Forest ~ Skateboard to be replica of Grooms skateboard. Hum a skateboard? How can we make a cake with no fake elements look like a skateboard? Brainstorming sessions. 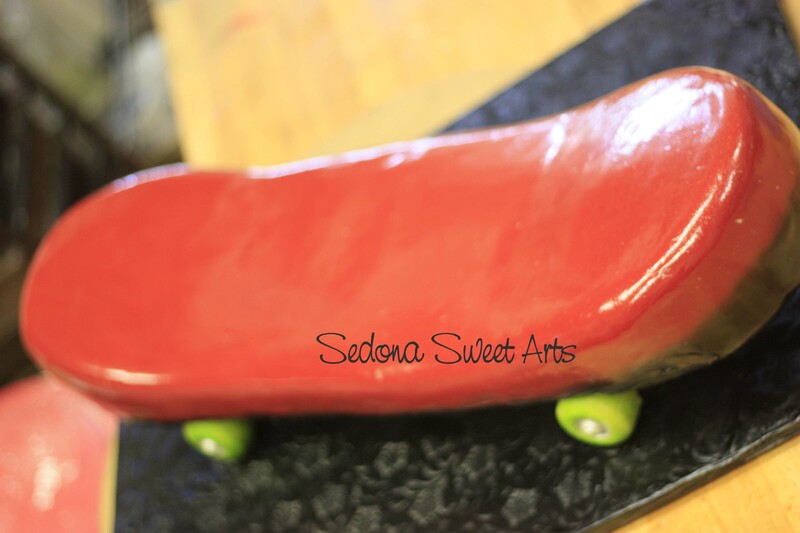 While looking around we found a few skateboard cakes out there on their back with the wheels up. No Donna Joy wanted to have the cake standing on its wheels, looking close to the real thing. So for this cake we borrowed our neighbors skateboard. We used the skateboard for our template. Measuring scaling, creating a few mock ups, working on the sizing to get the scale as close to the real deal. We cleaned up the wheels. Then with food grade silicone Donna Joy created a mold from the wheels. Wanting to keep everything as tasty as possible we made the wheels from white chocolate. What a way to go, isn’t it? 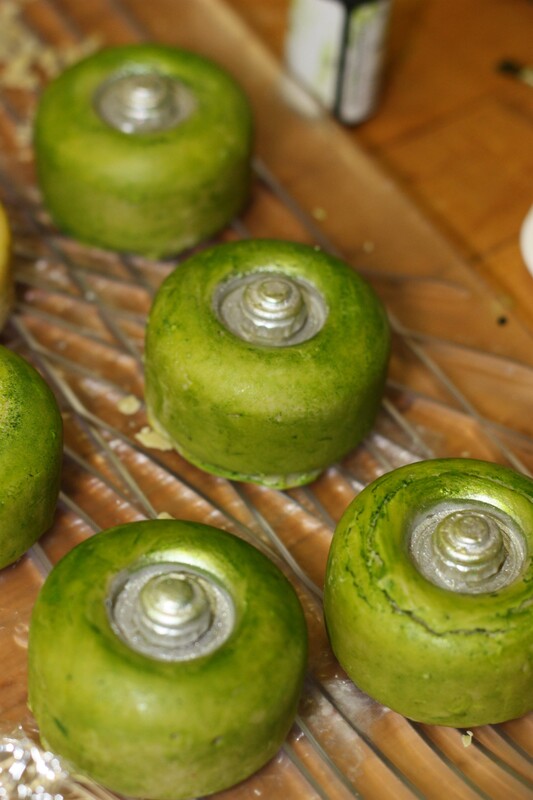 Then we needed the wheels to match the colors of the grooms skateboard wheels so we colored the white chocolate green, then molded the wheels. Once the wheels were molded we then painted the nut bolts to match his skateboard wheels. We worked with the mock ups to figure how many cakes along with what sizes of cakes we needed to bake. The cake was going to be two tiers. The base tier, a platform of cake (with filling), the underneath chassis for the skateboard, This cake support system was not intended to be seen. 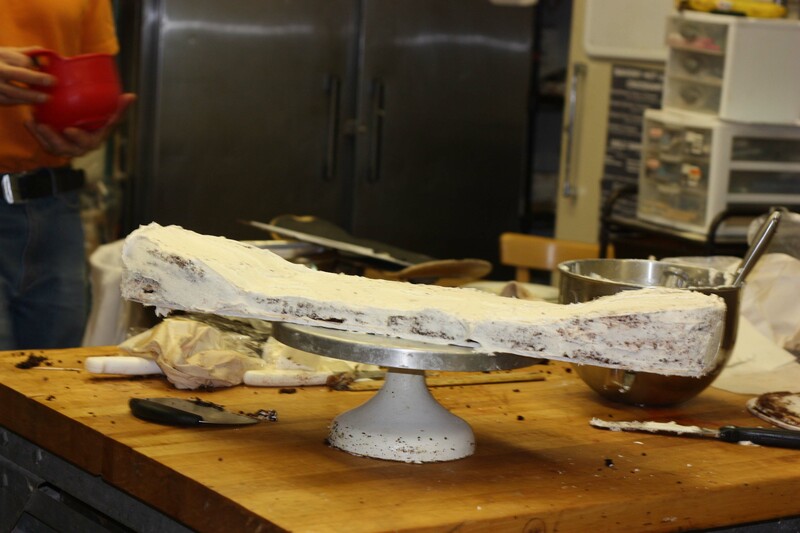 Then one long flatter tier that would sit on top of the cake chassis, representing the board of the skateboard. Yes we will sculpt cakes with fillings….crazy isn’t it? Donna Joy got the logos from the Bride. The bride took the pictures with her digital camera. Then Donna Joy took the images into photoshop, where she cleaned them up and sized them. They were then printed onto frosting paper. They weren’t as perfect as we would have liked due to the method and the resolution of images. The Skateboard design was to have the skateboard on its wheels making the board portion thicker then a real skateboard so that they could have real cake. It is actually carved being thicker on edges and thinner in the middle to give the look of the skateboard curving upward on the edges. Then those edges would be airbrushed dark in color in order to hide the thickness. The cake is going to be transported completely assembled to the wedding venue. Okay day of…… Donna Joy puts the individual elements to together. 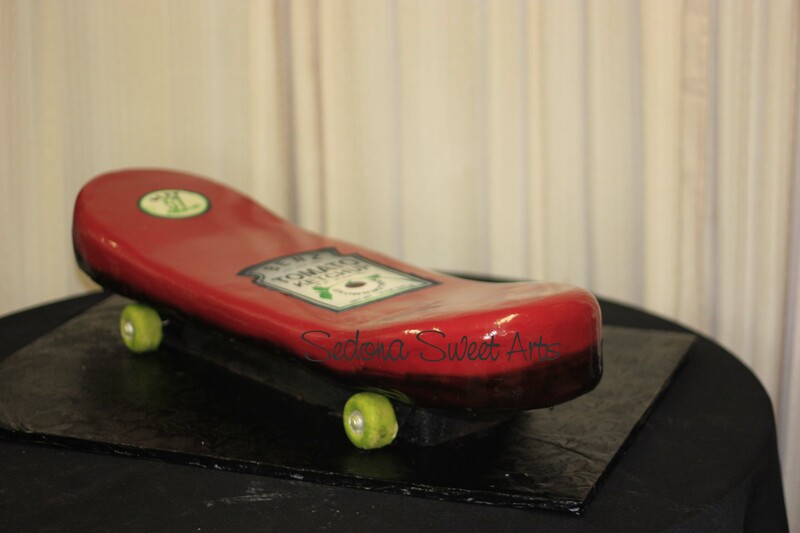 The cake chassis, along with the skateboard portion. 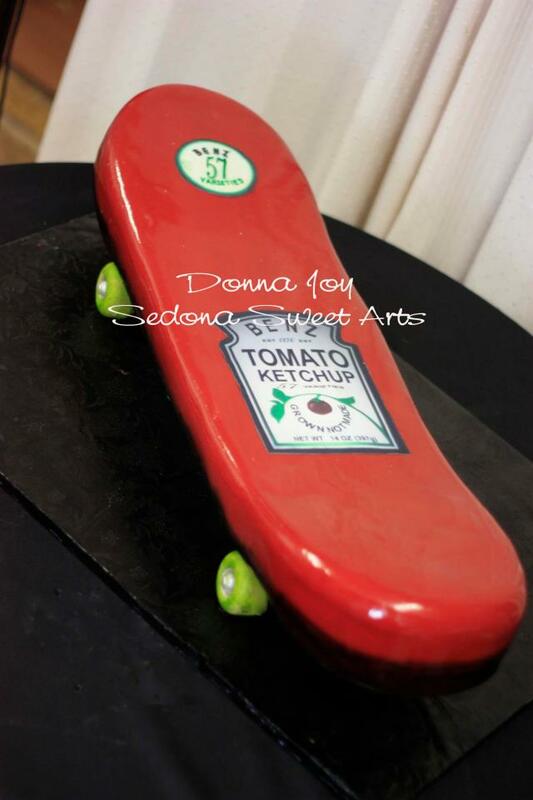 The fondant has yet to be placed on skateboard. Donna does a test. OUCH! The cake is cracking! Panic Panic!!!!! Oh no…..will we have cake on our face? What to do…. Donna’s head is racing. Dana is the one who stays calm. Phone ringing, customers running in the front of store ordering food to go. Seriously? One could have a melt down. Cracking cake 4 hours to go. Time is running out. And we wonder why Donna Joy gets high blood pressure, oh my. Donna suggests ideas to Dana. He tells her to set it down and think it through calmly. Does she? Yes and no. Then taking Dana’s suggestion of a 15 time out she decides to make the chassis longer. Could this cake be done with out team work? NO. A small portion of the chassis will be seen at certain angles. Not the desired design but will do. Donna takes the extra cake and builds on to the cake chassis. Test …YES! The cake isn’t cracking when placed on the chassis. So what are your thoughts? Is this a piece of cake? We always laugh as people call to order a cake like this and then say ” have fun with it” or say “what it’s not $50 bucks?” Yes we hear that allot, “oh I thought it would be around 50 dollars”. We love the challenge, we love, LOVE, Love,creating new things. They’re not always easy. We try with all our might to create cakes that are really cake, taste better than the look and are affordably priced. Can’t wait for the next cake challenge. We hope you love this post. Give us a call at (928) 282-4635 to order your custom cakes. Follow us on Facebook or our web site. Deceivingly difficult cake to do. Carved cakes always are a huge challenge. They always come out different than you plan.